Brush control works, as this picture clearly shows. 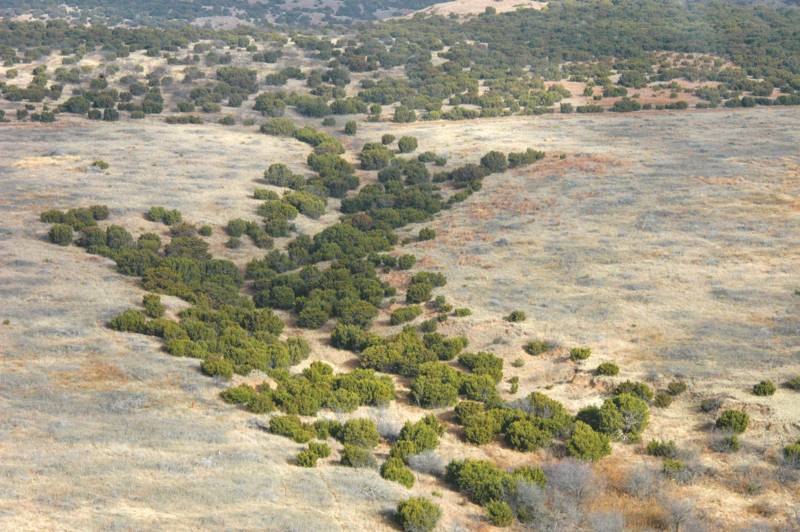 Juniper and mesquite provide a beautiful setting on Palo Duro Canyon rangeland, but brush-infested pastures benefit neither cattle nor wildlife. In contrast, areas of extensive brush control provide the JA Ranch with more open grazing and more diverse habitat for wildlife. It’s a fight he’ll likely never win. But with an extensive prescribed burn, herbicide and grubbing program, Andrew Bivins hopes to eventually mimic Mother Nature in minimizing forage loss caused by the pasture predators of brush and weeds. Those are the tactics in Bivins’ battle with water-robbing woody plants like juniper and mesquite. And while he still has a long way to go, he’s pleased with the outcome so far. Bivins is part of a long-standing Texas Panhandle ranching family. He runs the historic JA Ranch about an hour southeast of Amarillo. One of the first ranches in the area, James Adair and famous cattle baron Charles Goodnight established the JA in the 1870s. In addition, Bivins’ family continues to operate the XL Ranch outside of Amarillo, as it has for over a century. Much of the JA lies in Palo Duro Canyon, where the terrain is rough and rocky, and grass is a premium. 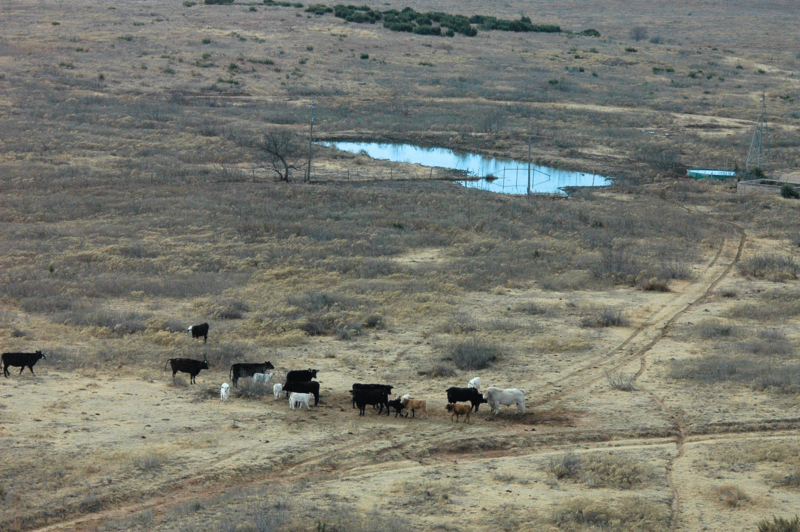 The ranch averages 18 to 20 inches of annual rainfall. It relies on native grasses, mainly side-oats grama, buffalograss and little bluestem. Since grass can be scarce, virtual forests of juniper and widespread mesquite and prickly pear cactus are more than a menace. “Brush control helps us open up more grazable acreage and reduces gathering costs,” Bivins says. Bivins works with the Natural Resources Conservation Service (NRCS) and Texas A&M University AgriLife Extension to identify methods of controlling woody plants and cactus. He also consults with herbicide company reps to develop prescription spray programs. “In early years, natural prairie fire would normally set back about 10% of encroaching woody species,” Bivins says. “Our red berry juniper was much less prevalent 100 years ago. However, when ranchers and others began working to suppress wildfires, the juniper spread deeper into grassy areas. What’s more, juniper grubbing is extremely cost-prohibitive. “It costs $400 to $450 per acre. You’re basically rebuying the ranch.” Following grubbing, a cost-efficient prescribed fire costs $10 to $12 per acre to clean up re-sprouts and dead trees on the ground. Brush management has opened significantly more grazing for the Angus-Charolais-cross cattle on the JA Ranch. With better grazing come higher stocking rates; costs and returns must be considered, though, to ensure brush control adds to the bottom line. Prescribed burning is usually done between January and March, when grass is dormant. With the Texas Panhandle region’s reputation for strong winds, Bivins monitors weather forecasts for mild days and 23% to 35% humidity. “Fire is a very valuable tool when done correctly,” he says. “If folks don’t respect fire, they will end up losing [control of] it — and possibly cause loss of property or even loss of life.” That’s why safety of fire and property managers, livestock and wildlife is the main concern. Long-term weather can also impact the effectiveness of a prescribed burn, says Tim Steffens, professor of rangeland resource management at West Texas A&M University in Canyon, and Extension rangeland specialist for Texas A&M AgriLife. Steffens says producers must decide which pasture management program can best handle their problem. For herbicide selection, Steffens relies on AgriLife and other Extension research findings. The trick is assuring herbicides are used correctly on the correct plant. Some producers see one weed and immediately spray. Others have never used a herbicide in their lives. Before taking immediate action against weeds or brush, consider why they are there. “Take a drive down the highway,” Steffens suggests. “Look on one side of the fence with weeds or brush, then look on the other, where the pasture is clean. That shows it’s probably a management issue for the infested pasture. One guy is having a problem, and one guy isn’t,” he says. After a severe drought like in 2012 in the Midwest and 2011-13 in much of the Southwest, prudent herbicide management is even more important. “Once rain finally returns, there can be big flushes of weeds,” Steffens says. “But they’re likely annual weeds and will often go away, especially if they’re native. Native grass will likely come in behind them without the expense of killing the weeds. If we manage to favor the grass, herbicide may not be needed. You can predict some problems, he adds. “Parts of the High Plains see annual broomweed. If it’s a dry summer, but a wet fall and winter, we may see annual broomweed in the spring. We can plan to control it early on. If our grazing during the drought increases the amount of bare ground, we can expect a bigger problem that is harder to control. Draws on the JA Ranch usually are not burned or grubbed to benefit wildlife, help control erosion and capture more runoff. What’s more, herbicide application may control weeds but may also increase palatability of poisonous plants that are then more likely to be consumed by livestock. Steffens says herbicide-treated areas with poisonous plants present should not be grazed until the toxic plants dry up and lose their palatability. Bivins says weed and brush control can be just as important to a ranch’s bottom line as selecting the right feed supplement.